In order to fit a Gaited horse a saddle must be able to adjust to all 3 dimensions of the horses back. All TW Saddlery Saddles have the patented fitting system that is the only one in the world that can independently adjust to all 3 angles of a horse. The fitting system allows for a horse to gait freely without shoulder pinching or restriction of movement. The cushioning of the movement of the muscles that attach to the scapula make longer strides comfortable and more fluid for the horse. This is very important for long distance and endurance riding. When Gaited horse are uncomfortable they are often reluctant to gait freely. Click here to see our video on why TW Saddlery has the best saddles for gaited horses! The Trail Light weighs 18lbs and features a soft padded seat that is cushioned down through the riders mid thigh. 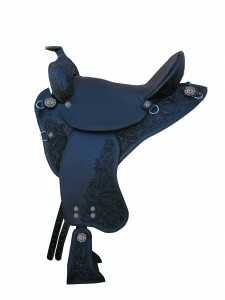 The seat is attached to the saddle by 4 screws as well as industrial strength hook and loop material and is interchangeable. Seats are available in smooth leather, suede leather, or fleece. The TW Saddlery Trail Light and Featherweight Trail are designed to precisely fit Gaited horses. 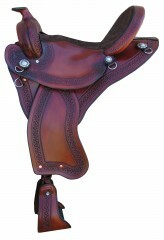 The trail saddles are lightweight weighing 18-19 lbs. They are very easy to put on the horse and take off, as well as lighten the weight your horse carries. The Featherweight Trail and Trail Light are available with English or western rigging to suite any riders needs. A short round skirt is also standard as a single layer or double butterfly that does not interfere with movement, even when riding in the mountains.